Apple's GarageBand isn't just a feature-packed music production studio for macOS and iOS – it's also a great way to learn an instrument, and it's now an even better teacher with free Artist Lessons for piano and guitar. Artist Lessons were formerly available for US$4.99 (about £4, AU$7) each as in-app purchases, but are now bundled as part of the free Basic Lessons library. They launched in 2009 as a way for aspiring musicians to learn popular songs from the people who made them. Sting, Sarah McLachlan, Fall Out Boy and Death Cab for Cutie all created lessons, which were initially only available in 20 countries. The latest Garage Band update not only lifts the price tag, it loosens the geographical restrictions as well, making the celebrity tutorials available in more than 150 countries. 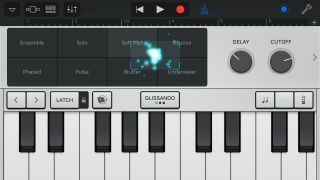 The update also gives GarageBand's library a boost with 1,000 new electronic and urban loops, plus 400 animal, voice and machine sound effects. There are new instruments too, including the guzheng or Chinese zither, koto (the national instrument of Japan) and Japanese taiko drums. There's also a compatibility update for the app's iOS version, making life easier for musicians who switch between mobile and desktop devices.